Washington DC: Parliamentarian Tsewang Rigzin commenced his official visit by meeting Diane Feinstein, United States Senator on 11th February, 2019. He also met political consultants at the offices of Senator Amy Klobuchar and Senator Tina Smith, briefed about the current critical situation inside Tibet, ongoing self-immolations and about political prisoners like the 11th Panchen Lama and Tashi Wangchuk. 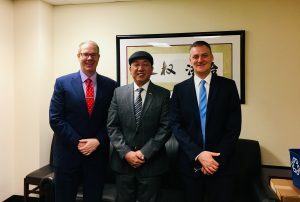 Next day, he met Scott Flipse, policy director of Congressional-Executive China Commission (CECC) of U.S and Tibet Researcher John Lindblom from CECC. They discussed the American policies on China concerning Tibet’s Issue. He also attended Thank You America program and met Nancy Pelosi, Speaker of the United States House of Representatives and thanked for her perpetual support to Tibet and Tibetans. He addressed the program by expressing gratitude and thanking America for its undying support to Tibet, at the same time he also appealed to raise the issue of Tibet in their future meetings with Chinese diplomats and appoint a Special Coordinator for Tibet Issue. He requested them to support Central Tibetan Administration’s policy concerning the human right abuses in Tibet. He emphasized on fulfilling His Holiness’ wish of going back to Tibet.